1. Xu Xing. A New Psittacosaur (Psittacosaurus mazongshanensis sp. nov) from Mazongshan Area, Gansu Province, China. in Sino-Japanese Silk Road Dinosaur Expedition (ed.) Dong Zhiming. China Ocean Press. (1997). 48-67. 5. 高克勤、程政武和徐星. 中国中生代有尾两栖类化石的首次报导。中国地质， 248 (1998)：40-41. 7. Xu Xing, Tang ZL, Wang XL. A therizinosaurid dinosaur with integumentary structures from China. Nature, 399 (1999):380-384. 10. 徐星. 鸟类飞行是如何起源的?——评《鸟类的兴起——两亿两千五百万年的进化》. 古脊椎动物学报, 37(4)( 1999): 330-333. 15. 张福成, 徐星, 吕君昌, 欧阳涟. 孔子鸟（Confuciusornis）、扬子鳄（Alligator）及一兽脚类恐龙长骨组织结构和生长方式差异及其意义. 1999. Palaeoworld. 11: 296-309. 24. Xu Xing, Zhou ZH, Prum R. Branched integumental structures in Sinornithosaurus and the origin of freathers. Nature 410(2001)：200-204. 26. Xu Xing, Zhao XJ, Clark JM. A new therizinosaur from the Lower Jurassic Lufeng Formation of Yunnan, China. Journal of Vertebrate Paleontology 21(2001): 477-483. 27. Xu Xing, Xiao-chun Wu. Cranial morphology of Sinornithosaurus millenii Xu et al., 1999 (Dinosauria: Theropoda: Dromaeosauridae) from the Yixian Formation of Liaoning, China. Canadian Journal of Earth Science. 38 (2001): 1-14. 34. Xu Xing, Zhang Xiao-hong, Paul Sereno, Zhao Xi-jin, Kuang Xue-Wen, han Jun & Tan Lin. A new therizinosauroid (Dinosauria, Theropoda) from the Upper Cretaceous Iren Dabasu Formation of Nei Mongol. Vertebrata PalAsiatica (古脊椎动物学报) 40(2002): 228-240. 35. Swisher CC, Wang XL, Zhou ZH, Wang YQ, Jin F, Zhang JY, Xu Xing, Zhang FC, Wang Y. Further Support for a Cretaceous age for the Feathered- Dinosaur Beds of Liaoning, China: New 40Ar/39Ar Dating of the Yixian and Tuchengzi Formations. Chinese Science Bulltin 46(23)(2002): 2009-2013. 36. Wang XL, Zhou ZH, Zhang FC, Xu Xing. A nearly completely articulated rhamphorhynchoid pterosaur with exceptionally well-preserved wing membranes and “hairs” from Inner Mongolia, northeast China. Chinese Science Bulletin 47(2002): 54-58. 37. Zhang FC, Zhou ZH, Xu Xing, Wang XL. A juvenile coelurosaurian theropod from China indicates arboreal habits. Naturwissenschaften 89(2002): 394-398. 40. Xu Xing, Wang XL. A new maniraptoran dinosaur from the early Cretacous Yixian Formation of western Liaoning. Vertebrata Palasiatica(古脊椎动物学报). 41(3)(2003): 195-202. 41. Xu Xing, Cheng YN, Wang XL, Chang CS. Pygostyle-like structure from Beipiaosaurus (Theropoda, Therizinosauroidea) from the Lower Cretaceous Yixian Formation of Liaoning, China. Acta Geologica Sinica (English edition). 77(3)(2003): 294-298. 42. Chuong CM, Wu P, Zhang FC, Xu Xing, Yu MK, Widelitz R, Jiang TX, Hou LH. Adaptation to the sky: defining the feather with integument fossils from Mesozoic China and experimental evidence from molecular laboratories. Journal of experimental Zoology (Mol Dev Evol). 298B(2003): 42-56. 43. You Hailu, Xu Xing and Wang Xiaolin. A new genus of Psittacosauridae (Dinosauria: Ornithopoda) and the origin and early evolution of marginocephalian dinosaurs. Acta Geologica Sinica (English edition). 77(1)( 2003): 15-20. 46. Xu Xing, Wang XL. A new dromaeosaur (Dinosauria:Theropoda) from the Early Cretaceous Yixian Formation of western Liaoning. Vertebrata PalAsiatica (古脊椎动物学报) 42(2)(2004), 111-119. 47. Xu Xing, Wang XL. A new troodontid (Theropoda: Troodontidae) from the Lower Cretaceous Yixian Formation of western Liaoning, China. Acta Geologica Sinica (English Edition) 78(1)(2004), 22-26. 49. Xu Xing, Zhang FC. A new maniraptoran dinosaur from China with long feathers on the metatarsus. Naturwissenschaften, 92(2005), 173-177. 51. Barrett PM, Xu Xing. A reassessment of Dianchungosaurus lufengensis Yang, 1982a, an enigmatic reptile from the Lower Lufeng Formation (Lower Jurassic) of Yunnan Province, People’s Republic of China. Journal of Paleontology 79 (5)( 2005), 981-986. 52. Rauhut, OWM, Xu Xing. The small theropod dinosaurs Tugulusaurus and Phaedrolosaurus from the Early Cretaceous of Xinjiang, China. Journal of Vertebrate Paleontology 25 (1)( 2005): 107-118. 53. Wang XL, Zhou ZH, He HY, Jin F, Wang YQ, Zhang JY, Wang Y, Xu Xing, Zhang FC. Stratigraphy and age of the Daohugou Bed in Ningcheng, Inner Mongolia Chinese Science Bulletin 50 (20)( 2005), 2369-2376. 54. You HL, Xu Xing. An adult specimen of Hongshanosaurus houi (Dinosauria: Psittacosauridae) from the Lower Cretaceous of western Liaoning Province, China. Acta Geologica Sinica (English Edition). 79 (2)(2005), 168-173. 55. Xu Xing. Feathered dinosaurs from China and the evolution of major avian characters. Integrative Zoology 1(2006), 4-11. 57. Xu Xing, Norell MA. Non-Avian dinosaur fossils from the Lower Cretaceous Jehol Group of western Liaoning, China. Geological Journal, 41(3-4)(2006): 419-437. 61. Xu Xing Deinonychosaurian fossils from the Jehol Group and the coelurosaurian evolution. Journal of the Graduate School of the Chinese Academy of Sciences. 23 (5)(2006): 708-712. 63. Clark JM, Xu Xing, Eberth D, Forster CA, Malkus M, Hemming S, Hernandez R. The Mid-Late Jurassic terrestrial transition: new discoveries form the Shishugou Formation, China. (2006) Pp. 26-28 in P.M. Barrett, D.J. Batten, S. Evans, J. Nudds, P.A. Selden and A. Ross (eds) Ninth International Symposium on Mesozoic Terrestrial Ecosystems and Biota. Department of Palaeontology, Natural History Museum of London, Manchester, England. 67. Jia CK, Foster CA, Xu Xing, Clark J. The first stegosaur (Dinosauria, Ornithischia) from the Upper Jurassic Shishugou Formation of Xinjiang, China. Acta Geologica Sinica (English Edition). 81(3) (2007): 351-356. (corresponding author). 69. Erickson G.M., Curry-Rogers K, Varricchio DJ, Norell, MA, Xu Xing. Growth patterns in brooding dinosaurs reveals the timing of sexual maturity in non-avian dinosaurs and genesis of the avian condition. Biology Letters. 3(2007): 558-561. 70. Mo J, Zhao ZR, Wang W, Xu Xing. The first hadrosaurid dinosaur from southern China. Acta Geologica Sinica. 81(4)(2007): 550-554. 71. Upchurch P, Barrett PM, Zhao XJ, Xu Xing . A re-evaluation of Chinshakiangosaurus chunghoensis Ye vide Dong 1992 (Dinosauria, Sauropodomorpha): implications for cranial evolution in basal sauropod dinosaurs. Geol. Mag. 144 (2)(2007), 247–262. 73. Benson R, Xu Xing. The anatomy and systematic position of the theropod dinosaur Chilantaisaurus tashuikouensis Hu, 1964 from the Early Cretaceous of Alanshan, People’s Republic of China. Geol. Mag. 145(6)(2008):778–789. 81. Balanoff AM, Xu Xing, Yoshitsugu K, Yusuke M, Mark AM. Cranial Osteology of the Theropod Dinosaur Incisivosaurus gauthieri (Theropoda: Oviraptorosauria). American Museum Novitates. 3651(2009): 1-35. 87. Xu Xing, Wang KB, Zhao XJ, Li DJ. First ceratopsid dinosaur from China and its biogeographical Implications. Chinese Science Bulletin. 55(16)(2010): 1631？1635. 89. Xu Xing. Horned dinosaurs venture abroad. Nature 465(2010): 431-432. 90. Xu Xing. A palaeontologist considers the evolution of birds’ mechanism of breathing. Nature 464(2010): 961. 91. Xu Xing, Luo ZX, Rong JY. 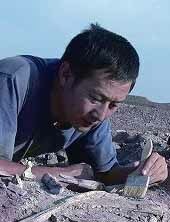 Recent advances in Chinese palaeontology. Proc. R. Soc. B. 277(2010), 161–164. 93. Xu Xing, Wang KB, Zhao XJ, Sullivan C, Chen SQ. A New Leptoceratopsid (Ornithischia: Ceratopsia) from the Upper Cretaceous of Shandong, China and Its Implications for Neoceratopsian Evolution. PLoS ONE 5(11)(2010): e13835. 2010. 94. Xu Xing, Choiniere J, Pittman M, Tan QW, Xiao D, Li ZQ, Tan L, Clark J, Norell M, Hone D, Sullivan C. Anew dromaeosaurid (Dinosauria: Theropoda) from the Upper Cretaceous Wulansuhai Formation of Inner Mongolia, China. Zootaxa 2403(2010): 1–9. 95. Xu Xing, Wang DY, Sullivan C, Hone D, Han FL, Yan RH, Du FM. A basal parvicursorine (Theropoda: Alvarezsauridae) from the Upper Cretaceous of China.Zootaxa 2413(2010): 1–19. 99. Amiot R, Kusuhashi N, Xu Xing, Wang YQ. Isolated dinosaur teeth from the Lower Cretaceous Shahai and Fuxin formations of northeastern China. Journal of Asian Earth Sciences 39(2010): 347–358. 101. Brusatte S, Chure D, Benson R, Xu Xing. The osteology of Shaochilong maortuensis, a carcharodontosaurid (Dinosauria: Theropoda) from the Late Cretaceous of Asia. Zootaxa 2334(2010): 1–46. 103. Choinierea J, Clark J, Forster C, Xu Xing. A basal coelurosaur (Dinosauria: Theropoda) from the Late Jurassic (Oxfordian) of the Shishugou Formation in Wucaiwan, People's Republic of China. Journal of Vertebrate Paleontology 30(6) (2010):1773–1796. 105. Eberth D, Xu Xing, Clark J. Dinosaur Death Pits From The Jurassic Of China. Palaios. 25(2010): 112–125. 106. Hone D, Xu Xing, Wang DY. A probable baryonychine (Theropoda: Spinosauridae) tooth from the Late Cretaceous of China. Vertebrata PalAsiatica (古脊椎动物学报) 48(2010): 19-26. 109. Hu DY, Li L, Hou LH, Xu Xing. A new sapeornithid bird from China and its implication for early avian evolution. Acta Geologica sinica (English Edition). 84 (3)(2010): 472-482. 111. Mo JY, Xu Xing, Eric Buffetaut. A new eusauropod dinosaur from the Lower Cretaceous of Guangxi Province, Southern China. Acta Geologica sinica(English Edition) 84(6)(2010): 1328-1335. 113. Zhang FC, Kearns S, Orr P, Benton M, Zhou ZH Johnson D, Xu Xing, Wang XL. Fossilized melanosomes and the colour of Cretaceous dinosaurs and birds. Nature. 463(2010): 1075-1078. 140. Xu, X. 2013. Giants unearthed. Nature, 496: 30. 142. Xu, X. & Macem, S. 2013. Tracing the evolution of avian wing digits. Current Biology, 23: 538-544. 144. Xu, X., Sullivan, C. & Wang, S. 2013a. The systematic position of the enigmatic theropod dinosaur Yixianosaurus longimanus. Vertebrata Pal Asiatica, 51(3): 169-183. 145. Xu, X., Tan, Q., Sullivan, C., Ma, Q., Hone, D., Han, F., Tan, L. & Xiao, D. 2013b. A new oviraptorid from the Upper Cretaceous of Inner Mongolia, China. Vertebrata Pal Asiatica, 51(2): 85-101. 147. Bever, G.S., Brusatte, S.L., Carr, T.D., Xu, X., Balanoff, A.M. & Norell, M.A. 2013. The Braincase Anatomy Of The Late Cretaceous Dinosaur Alioramus (Theropoda: Tyrannosauroidea). Bulletin of the American Museum of Natural Hisotry, 376: 1-72. 148. Gao, T.P., Shih, C., Rasnitsyn, A.P., Xu, X., Wang, X. & Ren, D. 2013. New transitional fleas from China highlighting diversity of Early Cretaceous ectoparasitic insects. Current Biology, 23: 1-6. 149. He, Y., Clark, J. & Xu, X. 2013. A large theropod metatarsal from the upper part of Jurassic Shishugou Formation in Junggar Basin, Xinjiang, China. Vertebrata Pal Asiatica, 51(1): 29-42. 150. Li, L., Tong, H.Y., Wang, K.-B., Chen, S.Q. & Xu, X. 2013. Lindholmemydid turtles (Cryptodira: Testudinoidea) from the Late Cretaceous of Shandong Province, China. Annales de Paleontologie, 99: 243-259. 151. Pol, D., Rauhut, O.W.M., Lecuona, A., Leardi, J.M., Xu, X. & Clark, J.M. 2013. A new fossil from the Jurassic of Patagonia reveals the early basicranial evolution and the origins of Crocodyliformes. Biol Rev Camb Philos Soc, 88(4): 862-872. 152. Wang, S., Sun, C., Sullivan, C. & Xu, X. 2013. A new oviraptorid (Dinosauria: Theropoda) from the Upper Cretaceous of southern China. Zootaxa, 3640(2): 242-251. 153. Xing, L.-D., Persons, W.S., Bell, P.R., Xu, X., Zhang, J.P., Miyashita, T., Wang, F.P. & Currie, P.J. 2013a.Piscivory in the featehred dinosaur Microraptor. Evolution, 67(8): 2441-2445. 154. Xing, L.-D., Roberts, E.M., Harris, J.D., Gingras, M.K., Ran, H., Zhang, J.P., Xu, X., Burns, M.E. & Dong, Z.M. 2013b. Novel insect traces on a dinosaur skeleton from the Lower Jurassic Lufeng Formation of China. Palaeogeography Palaeoclimatology Palaeoecology, 388: 58-68. 155. Yang, W.B., Niu, H.C., Sun, W.D., Shan, Q., Zheng, Y.F., Li, N.B., Li, C.Y., Arndt, N.T., Xu, X., Jiang, Y.H. & Yu, X.Y. 2013. Isotopic evidence for continental ice sheet in mid-latitude region in the supergreenhouse Early Cretaceous. Scientific Reports, 3(2732): 1-6. 157. Xu, X. 2014. Bedrock of China. Nature, 506: 32. 1. Xu Xing, Zhao XJ, Lu JC, Dong ZM, Huang WB. 1999. A new hardosaur-like iguanodontian dinosaur from the Late Cretaceous Sangpin Formation of Henan province, China. J. Vert. Paleontol. 19 (suppl. ): 86A. 2. Clark JA, Xu Xing, Forster C, Wang Y, Andres B. 2002. New small dinosaurus form the Upper Jurassic Shishugou Formation at Wucaiwan, Xinjiang, China. J. Vert. Paleontol. 22 (suppl. ): 44A. 3. Xu Xing 2004. Feathered dinosaurs from China and the origin of birds. Proceedings of the XIXTH international congress of Zoology (August 23-27, Beijing). Pp. 3-6. 4. Xu Xing, Zhou ZH., Zhang FC., Wang XL, Kuang XW. 2004. Functional hind-wings conform to the hip-strcuture in dromaeosaurids. Vert. Paleontol. 24 (suppl. ): 133A. 5. Clark JA, Xu Xing, Forster C, Wang Y, Eberth D. 2004. New discoveries from the Middle-to-Upper Jurassic Shishugou Fromation, Xinjing, China. Vert. Paleontol. 24 (suppl. ): 46A. 8. Xu Xing, Norell M. 2006. Dinosaur fossils from the Lower Cretaceous Jehol Group of China. Pp. 184 in P.M. Barrett, D.J. Batten, S. Evans, J. Nudds, P.A. Selden and A. Ross (eds) Ninth International Symposium on Mesozoic Terrestrial Ecosystems and Biota. Department of Palaeontology, Natural History Museum of London, Manchester, England. 9. Xu Xing, Clark JA. 2006. New ceratosaurs from the Jurassic Shishugou Formation of western China. J. Vert. Paleontol. 26 (suppl. ): 142A. 10. Clark JA, Xu Xing, Forster C. 2006. The fauna of the Middle-Upper Jurassic Shishugou Formation, western China. J. Vert. Paleontol. 26 (suppl. ): 50A. 13. Zhao Q, Xu Xing. 2008. A new theropod from the Early Cretaceous Yixian Formation of western Liaoning, China. J. Vert. Paleontol. 28 (suppl. ): 164A. 14. Xu Xing and Clark JA. 2008. Homologies in the hand of theropods. J. Vert. Paleontol. 28 (suppl. ): 163A. 15. Choinere J., Clark JA., Xu Xing, Forster C. 2008. A new basal coelurosaur from the Upper Shishigou Formation (Xinjiang, People’s Republic of China). J. Vert. Paleontol. 28 (suppl. ): 63A. 16. Sullivan C., Xu Xing, and Zhang F.-C. 2008. Some functionally significant aspects of ankle structure in theropod dinosaurs. J. Vert. Paleontol. 28 (suppl. ): 149A. 17. Choiniere J, Clark J, Xu Xing, Han FL. 2009. A new basal alvarezsaur from the Shishugou Formation. Journal of Vertebrate Paleontology. 29 (suppl): 77A. 18. Clark J, Xu Xing. 2009. Shartegosuchid crocodyliforms from the Late Jurassic of Asia and North America. Journal of Vertebrate Paleontology. 29 (suppl): 79A. 19. Hone D, Wedel M, Xu Xing, Clark J. 2009. A small Asian brachiosaurid sauropod dinosaur from the Late Middle Jurassic of China. Journal of Vertebrate Paleontology. 29 (suppl): 116A. 20. Hu DY, Hou LH, Xu Xing. 2009. A new enantiornithine bird from the Lower Cretaceous of western Liaoning, China. Journal of Vertebrate Paleontology. 29 (suppl): 118A. 21. Sullivan C, Hone D, Xu Xing, Zhang FC. 2009. The asymmetric carpus of advanced non-avian theropods and its role in the evolution of the flight stroke. Journal of Vertebrate Paleontology. 29 (suppl): 188A. 23. Zhao Q, Xu Xing. 2009. A study on ontogenetic changes in Psittacosaurus using geometric morphometrics method. Journal of Vertebrate Paleontology. 29 (suppl): 206A. 24. Blumhagen E, Brake A, Zhang FC, Xu Xing, Claessens L. 2010. Three-dimensional digital reconstruction of fossil birds and non-avian theropods preserved in slab and counterslab using laser surface scanning. Journal of Vertebrate Paleontology. 30 (suppl): 60A. 25. Choiniere J, Domitrov D, Anton-Fernandez C, Xu Xing, Clark J. Analysis of homology in serially repetitive morphological structures: the theropod digit problem. Journal of Vertebrate Paleontology. 30 (suppl): 72A. 26. Dececchi TA, Larsson H, Sullivan C, Xu Xing. 2010. A re-analysis of the “coelurosaurian pit-bull” Yixianosaurus longimanus with implications fro the theropod dinosaur diversity of the jehol Biota. Journal of Vertebrate Paleontology. 30 (suppl): 81A. 27. Larsson H, Hone DW, Dececchi TA, Sullivan C, Xu Xing. 2010. The winged non-aivan dinosaur Microraptor fed on mammals: implications for the jehol Biota ecosystem. Journal of Vertebrate Paleontology. 30 (suppl): 120A. 28. Sullivan C, Xu Xing, Zhang FC, Drake A, Cooper M. 2010. Function and evolution of the ankle joint in theropod dinosaurs. Journal of Vertebrate Paleontology. 30 (suppl): 172A. 30. Han FL, Xu Xing, Barrett P 2011. Anatomy of Jeholosaurus shangyuanensis and a phylogenetic analysis of basal ornithischians. Journal of Vertebrate Paleontology. 31 (suppl): 121. 31. O’Connor JM, Zhou Z, Xu Xing 2011. Small theropod with bird in stomach indicates both lived in trees. Journal of Vertebrate Paleontology. 31 (suppl): 168. 32. Sullivan C, Wang Y, Hone DW, Wang YQ, Xu Xing. 2011. The vertebrate fauna of the Jurassic Daohugou Biota from northeastern China, and its ecological and evolutionary implications. Journal of Vertebrate Paleontology. 31 (suppl): 201. 34. Zhang SK, Zhao ZK, Xu Xing. 2011. A large clutch of dinosaur eggs showing unexpected variability from Yun County, hubei Province, China. Journal of Vertebrate Paleontology. 31 (suppl): 219. 35. Zhao Q, Benton M, Hayashi S, Sander PM, Xu Xing. 2011. Long bone histology and growth patterns of Psittacosaurus lujiatunensis (Ceratopsia: Psittacosauridae). Journal of Vertebrate Paleontology. 31 (suppl): 220. 36. Clark, JA, Xu Xing, Choiniere, JN, Eberth DA, CHU HJ. 2012. The vertebrate fauna of the Middle-Upper Jurassic Shishugou Formation of Xinjiang, China: recent discoveries J. Vert. Paleontol. 32 (suppl): 79. 37. Hayashi S, Zhao Q, Watabe M, Carpenter K, Xu Xing. 2012. Phylogenetic and ontogenetic variations of bone histology in thyreophoran osteoderms. Journal of Vertebrate Paleontology. 32 (suppl): 108. 38. Stiegler JB, Choiniere, JN, Xu Xing, Clark, JA. 2012. A multi-element histological analysis of the Jurassic tyrannosauroid Guanlong wucaii. J. Vert. Paleontol. 32 (suppl): 179. 39. Sullivan C, Hone, DW, Rothschild BM, Wang KB, Xu Xing. Tyrannosaurid dinosaurs from the Upper Cretaceous Wangshi Group of Zhucheng, Shandong Province, China: coexisting giant Carnivores and a tyrant with a toothache. J. Vert. Paleontol. 32 (suppl): 181. 40. Wang S, Xu Xing 2012.A new oviraptorid specimen from the Upper Cretaceous of Southern China. J. Vert. Paleontol. 32 (suppl): 190. 41. Xu Xing. 2012. Origin and evolution of birds: combining paleontological and developmental evidence. 31st IUBS GA and Conference of Biological Sciences and Bioindustry. Xu Xing New feathered dinosaurs from the Early Cretaceous Yixian Formation of Liaoning, China. October, 1999. 59th annual meeting, Society of Vertebrate Paleontology. Denver, USA. Xu Xing, Zhou ZH, Wang XL. et al. Functional hind-wings conform to the hip-structure in dromaeosaurids. November 2004. 64th annual meeting, Society of Vertebrate Paleontology. Denver, USA. Xu Xing, Hu DY. An exceptionally well preserved Jurassic terrestrial fauna in northeastern China. September 2009. 69th annual meeting, Society of Vertebrate Paleontology. Bristle, UK.